Why European Union Trade Deal Hard to Sell? Tanzania president Magufuli consults president Museveni in Addis (file photo). The European Union has invited the government of Tanzania for dialogue over the Economic Partnership Agreement impasse that has threatened to derail the trade pact between the bloc and the East African Community member countries. The head of the EU delegation to Tanzania and the East African Community, Roeland van de Geer, said they were awaiting Dar es Salaam's position on the matter. "What is important is that we have dialogue," said Mr Geer during the Europe Day celebrations in the Tanzanian political capital Dodoma last week. "Tanzania has its own convictions, the EU have theirs. Tanzania is a sovereign country and should take its own decisions," he said, underscoring the importance of the dialogue. Tanzania has not signed the EPA, arguing that the trade agreement in its current form will have negative implications for its industrialisation strategy. Talks on the EPA are expected to feature for the East African Heads of State Summit on May 20. Only Kenya and Rwanda have signed and ratified the EPA deal, but being a Single Customs Territory, the other EAC members must sign the pact to make it enforceable. Burundi has also not signed, citing the resumption of EU aid to Bujumbura as a precondition for its signature. Uganda, on the other hand, said it will only sign the EPA if there was consensus among the EAC members. The EU-EAC EPA promises duty and quota-free access to EU markets for East African goods in exchange for a gradual opening up of the region's markets to European products. President John Magufuli, addressing a joint press conference with his Ugandan counterpart Yoweri Museveni at State House in Dar es Salaam recently, said that Tanzania was examining EPA, arguing that there was no rush to sign it. 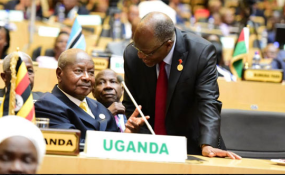 President Museveni concurred with his host, insisting that East African countries should first focus on issues of interest to their countries prior to signing. At the gathering, which drew many lawmakers from the European Parliament, National Assembly Deputy Speaker Dr Tulia Ackson said parliaments role on the EPA was to advise the government on how best to deal with the treaty. "We have constitutional duty to advise the government on issues of national importance," she said in her speech, adding that the parliament had advised the government on what was in the country's interest. "Practically, parliament hasn't said no to EPA, but there are issues that have been raised and the parliament will want them ironed out before the government makes its decision," noted the Deputy Speaker. A United Nations think-tank has, however, held reservations over the East African Community entering into an Economic Partnership Agreement with the European Union arguing that it will neither spur economic growth nor bring wealth to the region's citizens.